How do I grant or revoke access to an app? Setting member permissions to apps or forms from within the app's dashboard page. 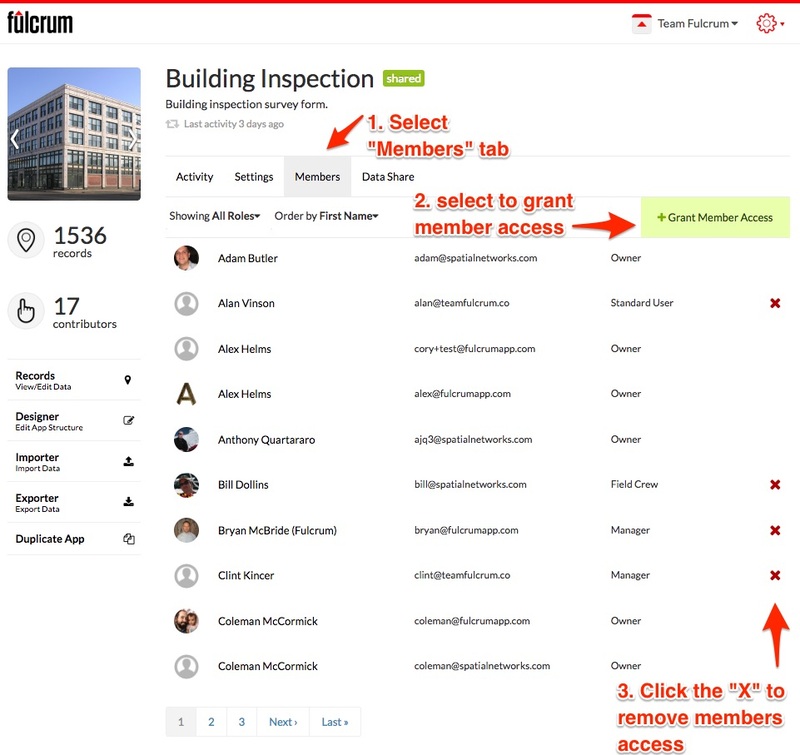 Fulcrum gives you granular control over which users in your account have access to each app. The ability to manage what users can access what apps can be done from two locations, the app's dashboard page and the members permission page. The best option to use will depend on your use case. If you wish to grant/revoke a specific user access to multiple apps then it is probably best to use the members permission page. If you wish to grant/revoke a group of users access to a specific app, then it is probably best to use the app's dashboard page. You can see how to leverage the members permission page here. Granting/revoking access through the app's dashboard page. Select the Members tab to see a list of all users that currently have access to your app. Clicking Grant Member Access will pull up a window where you can selectively grant access to members that do not currently have access to that app. To revoke access to the app, click the red 'X' for the specific users that you wish to no longer have access to that app. Any users with “Owner” permissions in your organization will automatically have access to all apps within the account. There is no way to remove owners access to apps. When adding new users to your account, you can also grant access to apps individually during the onboarding process for a new user.